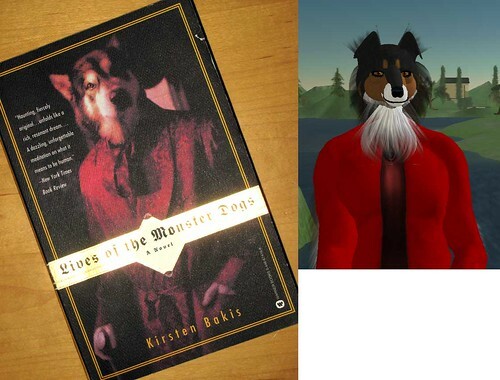 The book, Lives of Monster Dogs was recommend to me last week by someone (sorry, forgot who) at the NMC Symposium on Creativity in Second Life. "A postmodern Mary Shelley, taking the parable of Frankenstein’s monster several giant steps farther, might have written this fable of a novel about a tragic race of monster dogs–in this case, genetically and biomechanically engineered dogs (of several major breeds). Created by a German mad scientist in the 19th century, the monster dogs possess human intelligence, speak human language, have prosthetic humanlike hands and walk upright on hind legs. The dogs’ descendants arrive in New York City in the year 2008, still acting like Victorian-era aristocrats. Most important, the monster dogs suffer humanlike frailties and, ultimately, real suffering more serious and affecting than the subject matter might at first glance suggest." On getting my copy of the book (great prices at Powells! Wish they were in Phoenix), I was struck my the resemblance to my SL avatar. Now I have some fun reading for the flight to Chicago for the Second Life Community Convention. That person was Kieran Kiernan, now a friend!